This qualification is aimed at individuals wishing to take further training or to develop their knowledge and/or skills in this subject area. 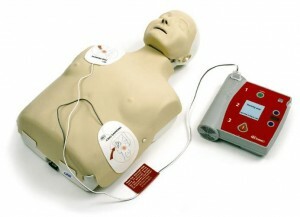 It is recommended for first-aiders in the workplace who have access to a defibrillator or is suitable for schoolchildren as recommended by The Resuscitation Council (UK). To complete this qualification learners should expect to undertake approximately 5 hours of learning, with a minimum contact time of 4 hours. These include be able to manage an unresponsive casualty who is breathing normally, be able to manage an unresponsive casualty who is not breathing normally, know how to safely use an automated external defibrillator and be able to safely use an automated external defibrillator. This qualification can be assessed by a practical demonstration and written/oral questioning. All successful students will be issued with a Level 2 award in Basic Life Support and use of an Automated External Defibrillator (RQF) certificate.